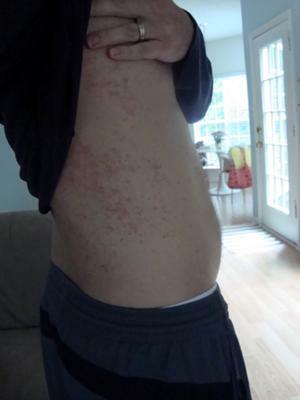 Starting in November of 2010, with some symptoms or signs, but later my skin all over my body became covered in a rash. It started on my wrists and quickly spread all over my hands, arms, legs, etc. 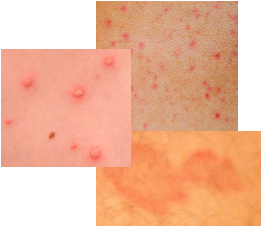 Doctors treated my skin rash condition for scabies two or three times, which seemed to help for a day or two, but then the rash came back very intense afterwards. I have tried oral steroids, Atarax, steroid creams, antibiotics, antifungals but nothing has successfully treated this skin rash. From the time period of December of 2010 to November 2011, the rash would "bubble" up and I would tear at it, leaving big, deep wounds on my feet especially, but generally this would occur all over my body. Someone finally suggested Dermatitis Herpetiformis, and I stopped eating wheat/gluten on November 1, 2011. So, over six months later I am not having the same "bone-itching" deep rash, but the generalized reddish superficial rash will NOT go away. Steroid cream takes the edge off, as does Atarax, but it doesn't make the rash go away. I recently undertook a new cycle of prednisone, which is helping significantly, but obviously I fear the rash is only being "covered up." I have been to three different dermatologists, one allergist, and three general practitioners. Two months ago, I stopped eating dairy altogether but this had no result. A couple of weeks ago I went three days eating nothing but brown rice and apples and still no results. If anyone can provide some helpful advice, I would appreciate it. I have attached a picture of the rash as it appears on the side of my torso. I've had rashes break out on my body only to find out that it was caused from within. I had a colonoscopy that it showed I have colitis. Colitis was causing my body rash. I am now taking probiotics, the best I could find, and now no more rashes! Thanks for the response. I am still working on it but I'm only one year into the gluten-free diet. Still early, I guess. I have Dermatitis Herpetiformis. It looks a lot like your picture. I've had to severely restrict my diet. First, I removed gluten and then reduced iodine almost completely (this is very important!). Then I started having some autoimmune reaction to dairy, then beans, then rice, and then bananas. Now all protein derived from plant sources cause the reaction/rash. I've reduced my diet to: beef, pork, chicken, squash, zucchini and Tang (has calcium) or orange juice (with calcium), non-iodized salt, and red and black pepper. I cannot eat most fruits or vegetables because of either their proteins or iodine content, but at least I'm finally clearing up. Those IgA deposits in your skin could last up to 10 years. YOU'VE GOT TO KEEP IODINE CONSUMPTION DOWN, IT EXACERBATES THE RASH/ITCHING!